This quote feels poignant for this interview as much of what Kelley does is inspired by her effort, her care, her intentions, and not by the “normal” measurements of success. This radical business owner doesn’t have a foolproof plan, she does however approach her life and this endeavor with an openness and fervor to create new space and ignite new ways to approach business in our ever wasteful world. 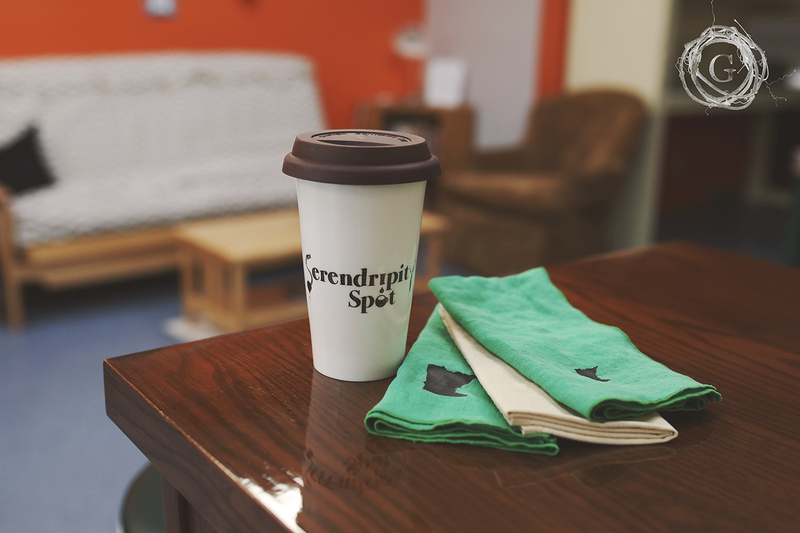 When convenience becomes America’s golden rule, a chance encounter with Serendripity Spot was a breath of fresh air – a waste free cafe on the northside of Minneapolis. At a quick glance, you might assume that there isn’t anything definitive that separates this cafe from any other. Board games, books, and puzzles sit stacked on a bookshelf. Twinkle lights are strung as a canopy over mixed and matched furniture creating a comfortable and eclectic vibe. The entire west wall is windows letting in full light, and the north wall is open for an array of local artists to display their work. You can buy local honey (Buzz Off and cross stitched humor (Crassstitch). Take a deeper look though and you will realize with great pride that this is the north side’s first waste free “sip ‘n stay” cafe. I had the great pleasure of sitting down with Kelley from Serendripity (a play off her most favorite word) to hear her story and journey in the commitment of running a waste free cafe. Much of this article is all in her own words because the transcript from the interview was just too beautiful to change. Kelley has a poetic curated way of speaking about her journey to environmental consciousness, and I simply didn’t want to alter that. It took about 5-6 years moving from average consciousness to taking more absolute measures. It took a natural path that lined up with climate change and how it shows up in our lives. It was about moving the concept from back brain to front brain. It’s been a percolating process. For me it moved from personal identification of being mindful and respectful of how much I use, and then how much my family uses. All of that is manageable in our daily lives but I don’t want to take anymore than I give. We live in a consumer model that is so much more about taking out than putting in, and an easy way to manage the carbon footprint is to reduce stuff. I took the idea of living in the solution to businessing in the solution. Before this, I was a nonprofit gal, in management and friend raising, fundraising, and communications for more than 20 years. It was. I know most parts of building a small business because you get to be a jack of all trades like I was in the nonprofit arena. Bookkeeping marketing, community engagement, I know how to do it all. Over time, I reached a stopping point because I was spinning on the same track and not able to try all the new things I wanted to. I was done and being your own boss helps with that. Running my own business had always been in the back of mind, and it was about seven years in the making. I am not motivated by monetary profit, but I am motivated by modeling an alternative. I try not being absolute about it, but instead suggesting a different way. There is so much grab ‘n go in our society, so I say instead, here is a sip and stay kind of place. I mean it’s imperfect, but it’s got heart and good intention. Speaking about it practically? Others can show their success measured in certain ways. I don’t know what my measurement is yet. I don’t know what will come out the other side. I hope it’s a community, or corner of a community that feel safer, welcomed, and invited. A place where we never stop learning. I am a native who moved away and now I am back. I first worked at a suburban food shelf, and the opportunity for food justice, economic justice, social and environmental justice, just became so abundantly clear through that. Being exposed to that process, I met a kindred spirit and he was ready and prepared to become an urban farmer. He would be the market farmer and I would be the brick and mortar location. We partnered together and decided we wanted to be in North Mpls. We were looking at locations that were resource deficient for our own competence and our own competition. I am not a foodie. I am not a culinary artist. Significance in a community is easier when you are surrounded by the same idea. It makes it more ok to try it on and see what fits. With Dylan Dorsey at strong side terra farms we found McKinley Community through Barb Johnson.We were scouring the area for commercial buildings and eventually met with the McKinley directors. McKinley Community is the local neighborhood association. 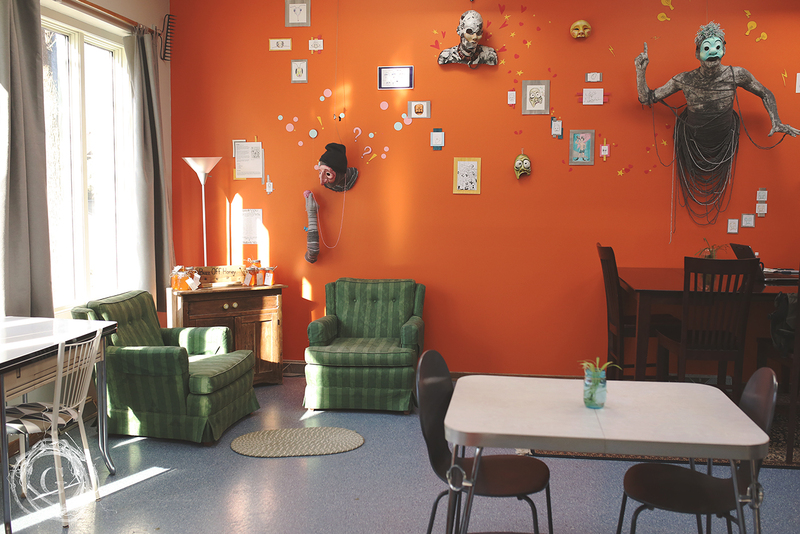 The McKinley building is ripe to be used as community space. To the outside world, some of our activities might looks the same, but they are separately operated. 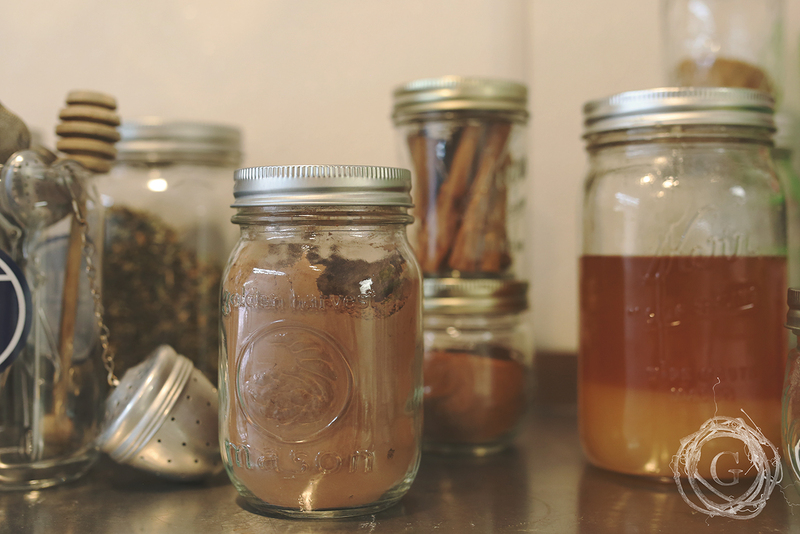 So practically what does it look like to run a waste free coffee shop? 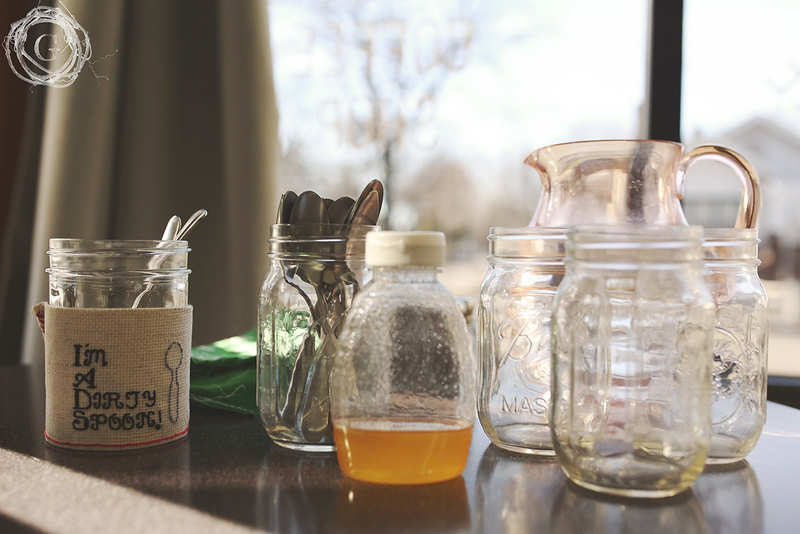 “Do It Yourself and Zero Waste is how I make my decisions. Does it work perfectly? No. But as a one-woman show,it works. To be small and strong is how I do it. I don’t make trash. Really the only throw away I have is craft paper from the deli meat and cheese I bring in. That is my only waste. Otherwise everything else is returnable and refillable. To me, recycling is unnecessary and resource inefficient too. I want people to know where their money is going. For every beverage and food item I sell, there is a base price to help pay for my investment in the space and then there is the cost of the product. It was hard to find an example to show me what to expect, but I based it on conservative guesswork and it is turning out okay so far. My products fall within the average cost of what you can find around here, and I will always make sure it is good quality. 90% of fruit and veggies are organic, but we prioritize local over organic. We have been open since September 24, 2016 when we sorta snuck open. I am most comfortable doing grassroots work and the customer response has been one of quality and more and more folks are becoming regulars. In the future I would love to see a partner come on board to open the cafe in the evenings, or a baker to provide sweets and goodies (right now cookies come from local hot spot Cookie Cart). The priority is to find more local providers of things like tea, soda, and ice cream as well as connecting with more north side artists and makers who want to sell their product here. Serendripity Spot drops compost off at local gardens to help nurture growth and food production. Everything is served on real dishes, and what if you come in for a to-go cup of coffee? Kelley has a stash of reusable travel coffee mugs, and “orphaned” ones you can buy dirt cheap. Simply buying my breakfast here, stopping in to say hi, or grabbing a cup of coffee, it reminds me of my own level of consciousness in how I live my life. The choices I make. How much disposable waste I create that could be avoided. So much to the point that if I am at another coffee shop and have forgotten my to go mug, I forgo the cup sleeve and lid. Two additional pieces of plastic I don’t want to waste. I am truly inspired by Kelley’s commitment to not just create this space that is working toward environmental justice but by simply existing, I am forced to acknowledge my own choices and the person I want to be and the effort I make in honoring and respecting the planet for myself, my community and future generations. If you live in or near Minneapolis, please come and stop by in support of the real changes and efforts Kelley is making how business can thrive and be apart of the solutions. You can find Serendripity Spot off Lyndale and Lowry in North Minneapolis. Come for coffee, a veggie plate, yoga, open mic night, story time or movie night. There is no shortage of events at this vibrant local hub.